Making the perfect steak on the grill requires practice and timing. Learn the steps to take to grill steaks beautifully each time. 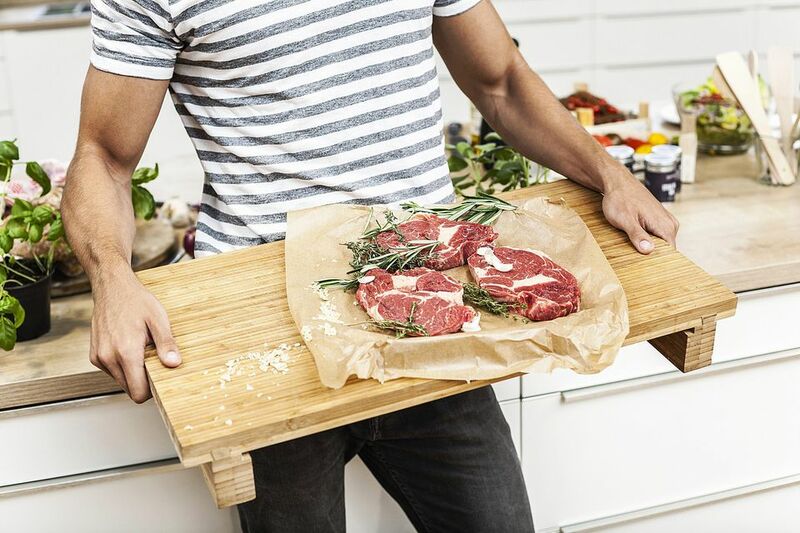 Given the differences between grills, cooking surfaces, and cuts of steak, there isn't a set rule for how long it will take to cook. A steak changes in texture and density as it cooks. Knowing how each steak feels before it hits the grill is going to help you hit the desired ​doneness. Go ahead and get a feel for your steak, literally. You can also use a thermometer to know when it has reached the right point. Take note of the thickness of the steak. A 1-inch thick steak is used for this demonstration, with advice on how to adjust for other thicknesses. Photo from Regarding BBQ Inc. The cooking surface must be clean and oiled so your steaks will have good contact with the grill without sticking. Oil the cooking grate while you are heating up the grill. The easiest way to do this is with an oil-soaked paper towel and the brush used to clean the grates. Fold a paper towel in half until it is the size of your grill cleaning brush. Soak it with oil that has a high smoke point, like an extra light olive oil or grapeseed oil. Brush this over the cooking grates evenly. It will smoke some, but enough oil will remain on the cooking grates as long as you don't let the grill sit at its highest temperature for too long before grilling. A good steak doesn't need a lot of seasoning, so it is important not to overdo it. A little salt and pepper will enhance the flavor and small amounts of herbs and spices can go a long way. Make sure that you get an even application of whatever you use. Remember that some of these seasonings will come off during cooking. You can apply the seasonings early to let the flavors sink in a little, but the effect isn't very noticeable. To get your steak cooked right, you need to grill it hot and fast. Searing the steak gives it a crisp, caramelized surface while letting you pick how well you want it done in the middle. You need to get your grill as hot as it will go. If you are using charcoal, you need a heavy layer of burning, white-hot charcoal. If using a gas grill, you need to let that grill heat up as hot as it will go. It is a good idea to know how hot your grill can get, so you know when it hits this temperature. Put the steaks on as soon as your grill reaches this point. For a steak that is rare, medium rare, or medium, leave the temperature as high as it can go. If you want your steak cooked past medium (medium well or well) let the grill heat up to its highest temperature, then turn the heat down a little. If you don't, the surface of the steak can burn and dry out before the center hits these higher temperatures. Have everything at hand before you put the steaks on the grill. Things are going to go quickly and you'll need to give it all of your attention. Keep the grill closed as much as possible to hold in the heat. Before putting on the steaks, take a good look at them. Decide what you are going to call the "top". When you turn the steaks you will want to know where that top is in order to get the perfect grill marks. You will cook the steaks in four positions, timing each change in position. If you are looking for a medium rare 1-inch thick steak, the cooking times are going to be one minute per position. If you want your steak medium well or well done, turn down the heat to medium-high heat (but leave it hot for the start). Your cooking times are going to be two minutes per position. If using a thicker steak (but under 2-inches) then the cooking times are going to be 1 1/2 minutes per position for medium well and 3 minutes per position for well. If your steak is less than 3/4-inch thick (but more than 1/2-inch) the cooking times are going to be 45 seconds or 1 minute per position for medium well to well. However, you need to know your grill. Some grills comfortably hit temperatures over 700 F, while others have trouble mustering 500 F. If your grill runs at a lower temperature, you might need to increase these times by as much as double. Now, open the grill and put the steak on with the top farthest from you—meaning that the top of the steak is to the back of the grill or at the 12 o'clock position. With the steaks on the grill, close the lid and start counting the time. For this example, assume a one-minute time per position. After the first minute, it's time to rotate the steak. You are not turning the steak over, you are going to rotate the steak 45 degrees from the 12 o'clock position to the 1:30 position. This will give you a professional-looking diamond pattern of grill marks on the steaks. Turn the steaks quickly and close the lid. Start timing the next minute. Another minute has passed and you're halfway through the cooking time. When you lift the lid of the grill, the steak should appear gray on the top (uncooked side). The heat of the grill is cooking the steak around the surface. If the steak appears raw on the top, put the lid down without flipping it and let it go for another minute. If the steak is gray, flip the steak over (uncooked side is now down), returning the top to the 12 o'clock position. Close the lid and start timing the next minute. As you prepare to turn the steak for the last time, it's time to start checking for doneness. The steak should show no red around the side and the top side should have a rich brown color. As you pick the steak up to rotate it 45 degrees (not flip), feel the density of the steak. A medium rare steak should be firm, but still, have a good amount of give. This should be a good indication of how much time you still need. Close the lid and continue grilling. If your steak needs more cooking time, leave it where it is and continue grilling on medium heat until done. Once you've eaten the steak it is time to record your findings. Keep track of the thickness and cut of the steak, the grilling temperature on your grill, and the time spent cooking it. Then consider how it was done. If your steak was undercooked by the end and needed more time, then next time, increase the four cooking times. If it was overdone, then decrease the four cooking times. Practice and observation are the keys to becoming a great steak griller.